Margaret Henson is available for media interviews at 087 935 9616. Anne O’Sullivan, Margaret Henson and Mary Winterlich each received a ‘Hospice Hero’ award from RTE’s Mary Kennedy for their outstanding dedication to North Westmeath Hospice. Anne, Margaret and Mary have, collectively, been involved in the hospice for almost 30 years and were among 23 volunteers across the country honoured for their contribution to hospice. 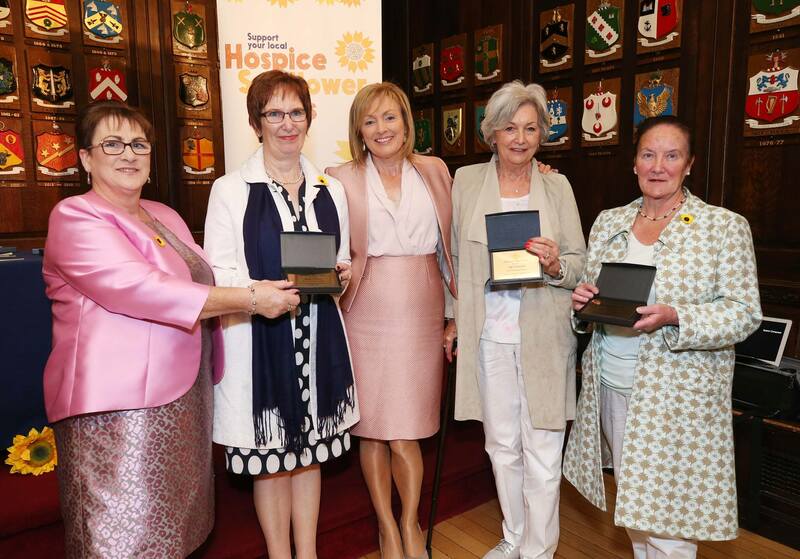 The presentation took place in the Mansion House Dublin at the national launch of Hospice Sunflower Days. This annual fundraiser for the hospice movement in Ireland is happening on Friday, June 9th and Saturday, June 10th. It is hoped €1million will be raised. The Irish Hospice Foundation (IHF) coordinates the event on behalf of the hospice movement including North Westmeath Hospice. All funds raised locally, stay locally. Money raised from the Sunflower Days are used to support the local Palliative Care Team. In 2016, this team provided services to over 300 individuals and families in the area. A national survey commissioned by the IHF revealed that 75% of Irish people want to die at home – however only one in four gets to do so. This is where Sunflower Days funds will help with the provision of hospice services in your area. Speaking at the launch, Mary Kennedy said: “Hearing the heroes’ stories today was inspiring. The feeling of human kindness was tangible and their dedication uplifting. Without the commitment of these men and women end of life would have been very different for many people and loved ones. “People matter and Hospice Care improves the lives of many who have a life-limiting condition in allowing them to live their lives as fully as possible right up to the moment of death. Hospice care is also about supporting families and loved ones up to and through bereavement in what is clearly a most challenging period in their lives. Thousands of people receive hospice care annually and funds raised through Sunflower Days helps meet this growing need. Hospices therefore are more reliant than ever on the goodwill of wonderful supporters and volunteers. IHF Andy Caffrey, Acting CEO said volunteers are the iron will that keep local hospices going. “Local hospices fill a need in society. Their impact is immeasurable. Hospices rely on public goodwill to deliver their services. Hospice Sunflower Days is a countrywide opportunity to help your local group mind your community. We are very proud to be coordinating Hospice Sunflower Days for the past 27 years,” he said. People can support their local hospice service on June 9th and 10th by purchasing various pieces of Sunflower merchandise – including sunflower pins for €2 each from collectors on the streets of cities, towns and villages across Ireland. For more information on how to volunteer with your local hospice service for Hospice Sunflower Days visit www.sunflowerdays.ie or email Veronica Larkin veronicalarkin9@gmail.com . Note to editor: The Irish Hospice Foundation has supported the voluntary hospice sector by creating and co-ordinating two annual national fundraising events including Sunflower Days and Ireland’s Biggest Coffee Morning for Hospice. All of the money raised from both campaigns stays with local hospices. An estimated €30 million has been raised for hospice services in Ireland since their inception.